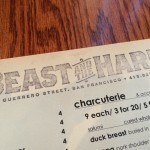 Located in the Mission District in San Francisco, Beast and the Hare represents “New American” dining, with a constantly rotating menu. 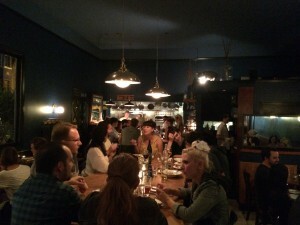 The restaurant itself is fairly small, with seating for perhaps 40-50 people, and a “neighborhood hangout” type of vibe. 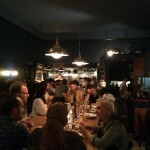 In the center of the dining room is a large bar height table that can seat up to 12 people. 2 and 4 topper tables ring the outside perimeter of the room, with a couple of tables along the windows. This is not a place for large groups. 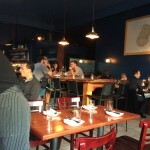 Food and orders appear from the semi-open kitchen in the back. We were given a gift certificate, which allows us to order 2 “smalls” (i.e. appetizers), 2 “bigs” (i.e. entrees), and 1 shared dessert. 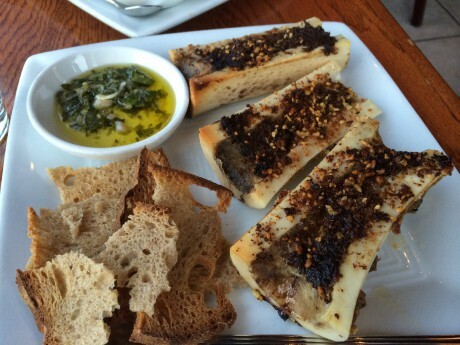 Reading the Yelp reviews, the consensus for “smalls” seemed to be the roasted bone marrow, and with nothing else catching our eye, we ordered 2 of those. Most yelpers also panned the rabbit stew, so for entrees we decided to lean more to the “Beast” side of the menu, staying away from the “Hare”, ordering the pork chop and the lamb 2 ways. 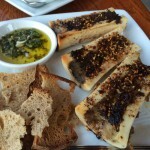 Mushroom and Bone Marrow Gratin with Grilled Toast – The marrow dish came out piping hot, with spoons to scoop out the marrow from the bones. Flavor was rich and the marrow was “spreadable” onto the toast made from their rustic wheat bread. Not sure the accompanying dipping sauce of herbs, vinegar, and olive oil really added to the dish, but I guess it was there to provide a palate cleanser or perhaps something else to spread on the toast? The dish holds up well on its own making that addition unnecessary. 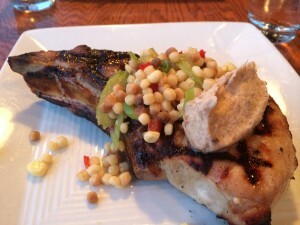 Grilled bone in pork chop, spring succotash and date creme fraiche – This was a large pork chop, brined and grilled, with nice sear marks. The meat itself was well cooked and seasoned properly. The date creme fraiche was an interesting addition, although like the dipping sauce that came with the marrow appetizer, I am not sure it added much to the dish. While very tasty by itself, it did not lend enough sweetness to the dish to make it well balanced. 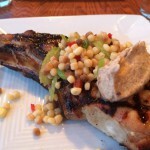 The succotash provided some acidic contrast to the chop, but again, I think it misses the mark as an entire dish . Lamb 2 ways – Lamb T-bone and Lamb Sausage with sweet potatoes, grilled asparagus – The lamb t-bone was well executed, with the proper render, with nice browning on the outside and just rare interior. 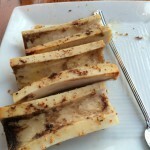 There was some compound butter resting on top of the chop, giving it some extra “moisture” and flavoring elements. Normally, I am not a big lamb fan, but when properly seasoned and cooked, the gamy flavor is less noticeable, which was the case here. 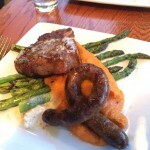 The sausage, to me, had more of the gaminess to it, but was also more strongly seasoned and spiced to compensate. Unlike the other dishes so far, I think this dish worked well as a whole. 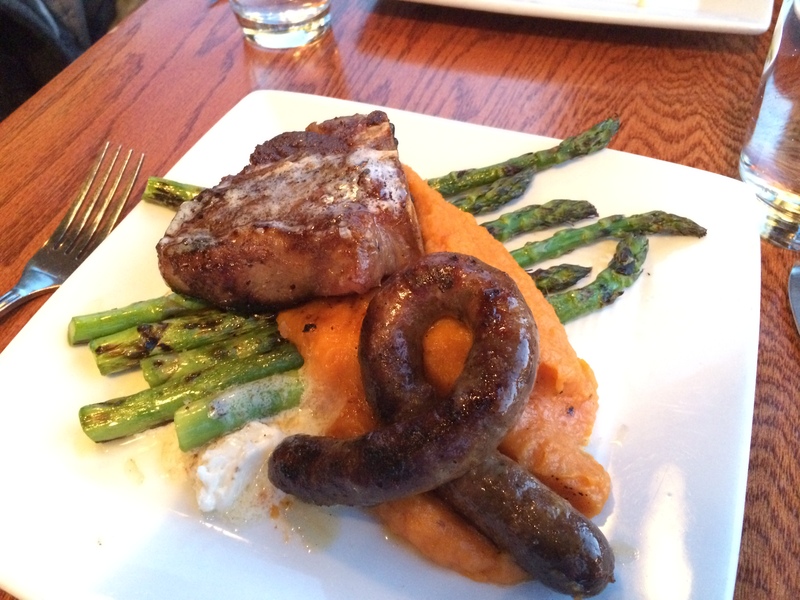 I enjoyed alternating bites of all the elements, with the sweet potatoes providing a nice contrast with the heavy lamb meat. 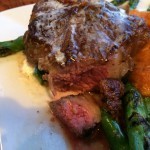 The grilled asparagus provided a nice contrasting texture to the other elements. 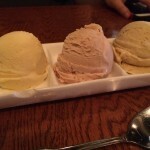 Trio of House Ice Cream – Cardamon, Rose, and Honey Jack Daniels – Usually desserts are hit or miss at restaurants like these and I am typically fairly skeptical about them, especially if the dessert menu contains very pedestrian fare (e.g. cheesecake, pies, flans/custards/panna cottas). But several yelpers mentioned the house made ice creams were very good and worth trying. 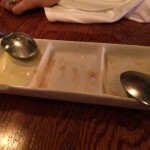 This also made me glad our gift certificate included dessert. While flavors change daily, it seems, the one stalwart is the Honey Jack Daniels. I would have to say that this is probably the best part of the meal, with the ice creams being very silky and rich without being overly sweet or over overpowering. 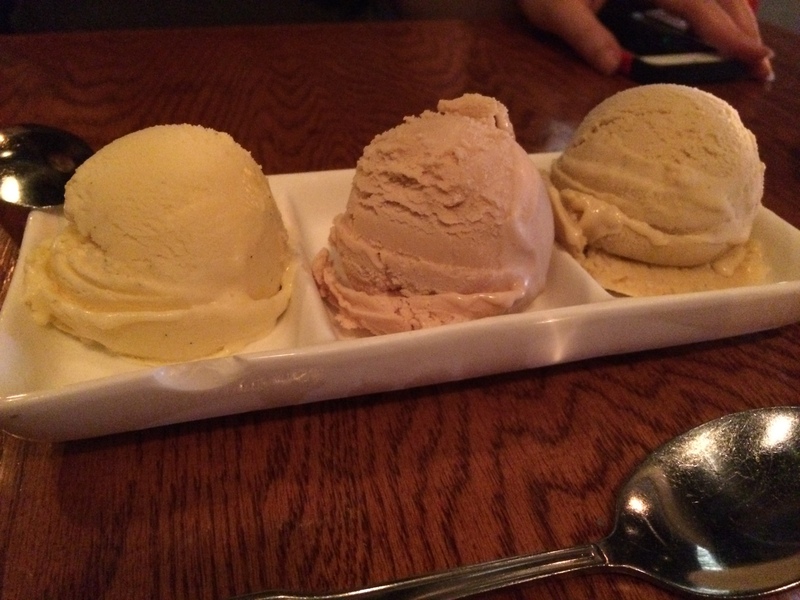 When I first heard cardamon as being one of the trio I expected it to be very much like chai tea, but the flavors were very subtle, allowing the creaminess of the base ice cream to come through. My initial impression of the rose flavor was slight dislike, as it tasted like milk seeped in rose petals. But with subsequent spoonfuls, the flavors mellowed a bit and I came around to liking it. I was expecting the Honey Jack Daniels to taste like the “adult” milkshare you can get at TGI Fridays or other burger joints, but like the other scoops, the whiskey flavor came through subtlety and balanced with the honey ice cream base. The one sticking point I would say was the service, but I don’t really fault the wait staff, who seated us promptly, took our orders and checked in on us periodically. It was more the pacing from order to when the food hit the table. Because of the constantly rotating/tweaking of the menu, I suspect there may be only one chef back there firing the main dishes, and a full house would definitely back up the kitchen in that respect. I would suggest ordering a charcuterie plate to tide you over until your entrees come, because in theory, these should only involve plating something that is already cooked. If you go in with more a European expectation of what dinner service and dining times should be, then you should feel very comfortable. If you go in with an American expectation, you will be a bit frustrated (as I was) with the pacing of the meal. Overall there were some hits and some misses, which made for a mixed experience this time around. 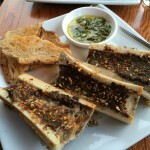 Some of the criticisms of the food that are levied above are somewhat nit picky, and our experience might have differed on a different day with a different menu and a different kitchen flow. The quality of the ingredients were top notch, and there is clearly a lot of cooking skills behind the food. 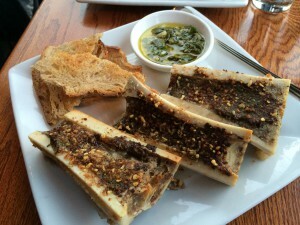 The entrees just did not have a big enough “wow” factor for me , but the bookends of the meal, namely the marrow and the dessert, compensated a bit for the entrees. 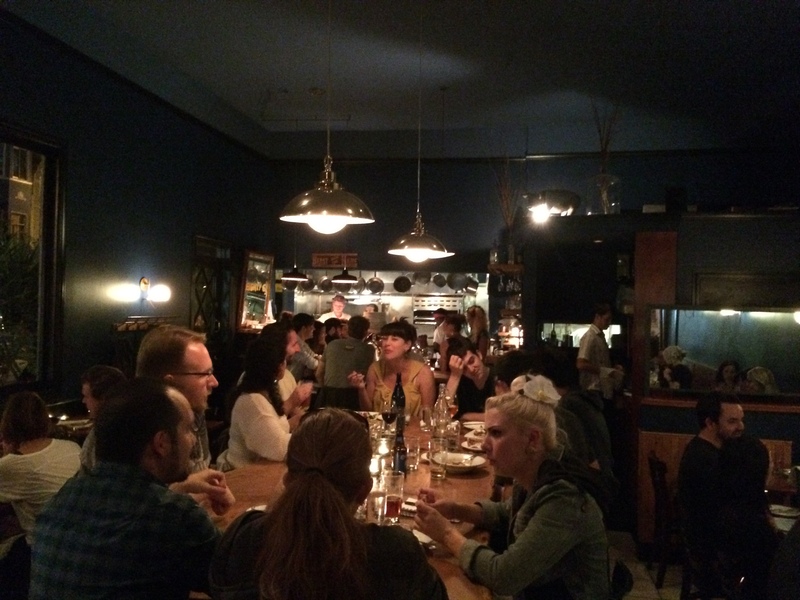 Different diners might have different thoughts, and I would suggest you try it for yourself. 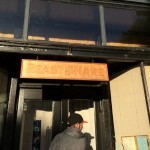 Would I return to Beast and the Hare? Given the other choices San Francisco has to offer, I would probably opt to try another place offering similar fare before returning. It just did not elicit a “I’ve gotta return” feeling in me that some other places have.